Today I am interviewing K.D. Keenan, author of the new fantasy novel, Fire in the Ocean, second book in the Gods of the New World series. DJ: Hi K.D.! Thanks for agreeing to do this interview! K.D. 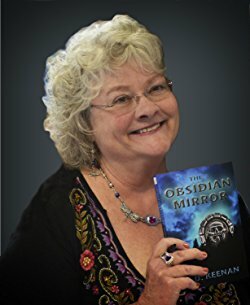 Keenan: Thank you for this opportunity to talk about my books! For more than 30 years I worked in Silicon Valley public relations and marketing, which was fun because I always had a little window into the future and could see new technologies under development. Silicon Valley became the setting for my first book, The Obsidian Mirror. My mother was an archeologist, and she sparked my interest in mythologies and ancient cultures. I live in a beach town on the Central Coast of California with my husband, my daughter, my son-in-law, two granddaughters, two elderly dogs and a cat. Between taking are of the grandkids and writing, I don’t have much time for hobbies, but I do design and make sterling silver jewelry. DJ: What is the Gods of the New World series about? K.D. : It’s about the entirely preventable damage we are wreaking on the environment. The Obsidian Mirror points out that the people who are defiling the earth also have to live here. It’s not like they breathe different air and drink different water than the rest of us, so what can they be thinking? 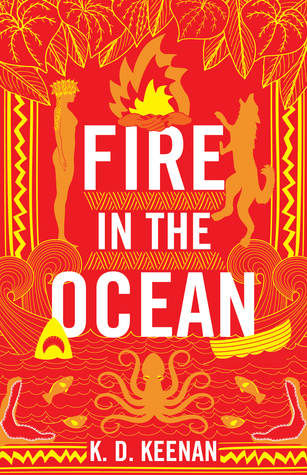 Fire in the Ocean highlights the damage we are doing to the oceans with plastic waste and development. The third novel in the trilogy, Lords of the Night, emphasizes the need to protect animals from our environmental destruction and casual cruelty.